This is more a mashup to accommodate my needs than a true remix. It combines the awesome featherboard by MarcElbichon with the extra large star grip screw by pastaclub. The original star grip screw is sized for M8. While pastaclub suggested to scale the model to fit M6 or other threads this would also scale up (or down) the star grip itself. I wanted to use M6 while keeping the original size of the star grip so I redesigned the inner part of the star grip to fit M6. Added a t-nut for the Bosch GTS10XC circular saw bench. This t-nut has two slots for flat (=3mm height) M6 nuts. Added a resized version of the featherboard with rails that fit M8 screws or threaded bars. 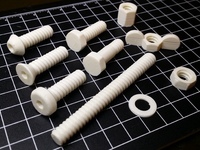 T-Nut for Bosch GTS10XC.stl. Print this only if you own this saw or if you are sure that it will fit your machine. If it doesn't fit you will have to use other M6 t-nuts! Star grip screw: Use a screw with hex head (or a nut/threaded bar combination) of appropriate length, stick it through the inner part of the star grip and fix it with super glue (or similar). Glue the inner part to the outer part. Done. 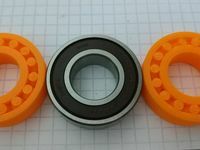 T-nut: Push flat nuts (height 3mm) into the hex shaped slots on the flipside of the t-nut. The fit is tight so push gently. A vise might come in handy. Here is a video on Instagram where you can see the featherboard in action. If you print this model and use it, you do this on your own risk. I cannot be held responsible if someone or something gets damaged or injured by using this model. I printed the featherboard with 18% infill and no support since my UM bridges fairly well. To increase sturdiness I used four outer walls. 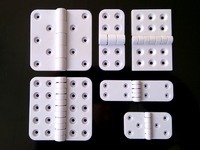 The inner part will have to withstand a lot of force while seizing and loosening the screw. 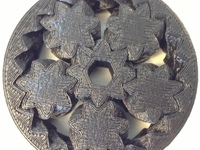 It is recommended to print the inner part with four outer walls and 100% infill. The outer part works fine for me with 18% infill and three outer walls. To play it safe I recommend four outer walls and 50%+ infill.